Great news for keyword researchers — Keyword Magic tool now allows you to find question-based keywords that contain your seed keyword in just one click! What do you need question keywords for? Knowing what people are asking related to your keywords might give you ideas for optimizing your content or creating new topics. By giving answers to common user queries, you can increase your traffic and link-building opportunities, as relevant content that solves users’ problems will definitely attract clicks and links. Besides, if you optimize your content for a question-based keyword, Google can improve your visibility by awarding you with a SERP snippet, such as a featured snippet. 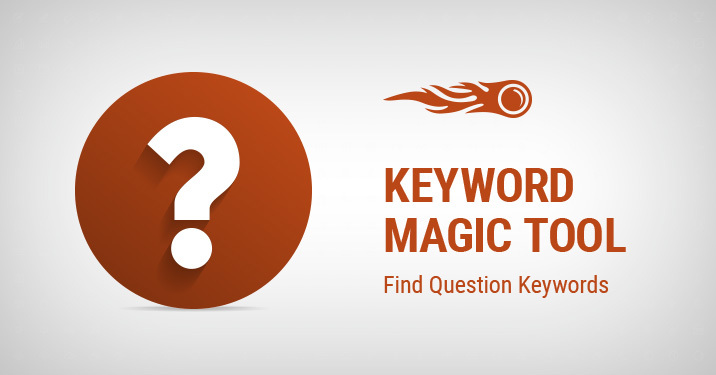 How can you find your question keywords? Go to Keyword Magic tool and enter a keyword. On the right you’ll notice the ‘Questions’ button. Click on it and check the list of questions that contain your seed keyword. The ‘Questions’ report works as a filter and takes into account all your other settings, such as Broad and Exact matches. Once you have a list of question-based keywords, don’t forget to send them to Keyword Analyzer for deeper research! What do you think about this update? Send us your thoughts at [email protected], and stay tuned, as more improvements are coming!